When I was in sixth grade, I didn’t have much fashion sense. Make that, I didn’t have any fashion sense. I was generally the last girl to figure out when something was in style, and by then, it was already going out of style. But even I knew that rainbow suspenders with badges were all the rage, and they were popular for one reason: Mork wore them on Mork and Mindy. To be honest, I remember thinking the television show was rather stupid, but because everyone else was watching it, I watched it too. My feelings for the show have changed. Recently, I heard the theme song, and a wave a nostalgia washed over me. That kind of nostalgia always makes me smile. 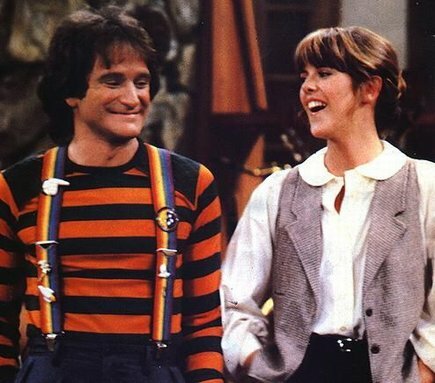 Posted on November 13, 2013, in Family, My life, perspective and tagged 365 reasons to smile, mork and mindy, musings, nostalgia, perspective, smiles, television. Bookmark the permalink. 60 Comments.